The following document explains how to create a recurring meeting. iPhone Calendar provides a limited number of options to specify an event that recurs over some pattern. iPhone Calendar calls these options Repeat options. The options are: Never, Every Day, Every Week, Every 2 Weeks, Every Month, Every Year. 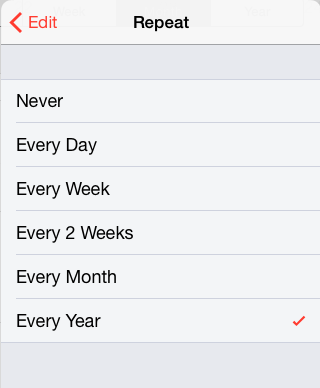 There is no option for repeating on a specific multi-week interval (e.g., every three weeks) or some day per week (e.g., the 3rd Thursday of every month). You can set a time limit for when the repeat ends. You can modify the Repeat options of existing or new events. Tap on either the Add Event or Edit display to see and set an event's Repeat options. Tap on Repeat to open the Repeat options. Select the desired repeat interval from the list. Tap on the red Done button when done. Tap on the red Day button at the top-left to return to the main iPhone Calendar display for that day. 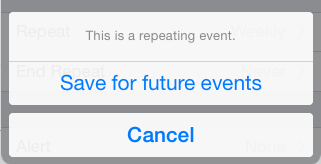 If you are editing an existing event with Repeats options previously set, you will get a confirmation display telling you "This is a repeating event." and asking you to confirm that you want to save the modifications for future. Tap on the Save for future events button to continue.